Insanity: Doing the same things over and over again, that don’t work, and expecting different results. Fun way to start out a piece of content, huh? While there are many ways to make consistent, even daily, content creation so much easier, one of my favorites is repurposing your current content. This really is working smarter instead of harder. Let’s say you’ve created a blog post for your blog. Good on you! 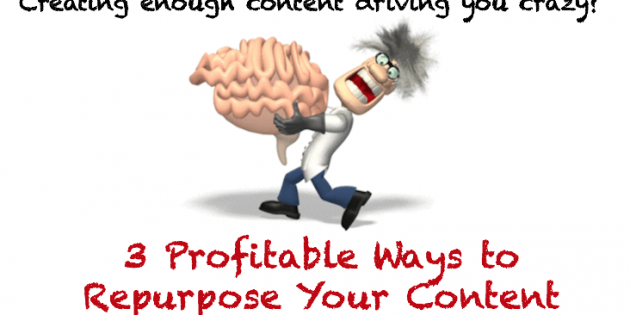 Now let’s look at 3 profitable ways to repurpose this one piece of content, one each in text, audio, and video. This is my current favorite source of high quality free traffic. And I can prove it – because you are reading this article right here on LinkedIn Publishing. Bring that blog post on over, add some graphics and a call to action, and you’re good to go! Why start from scratch when your blog post has all the content you need to create a short to medium length podcast. Back when I was a Counseling Psychologist and wrote a weekly relationship column for the newspaper, each week I would take that column over to the #1 soft rock morning show station and do 2 three minute interviews. From a content delivery standpoint, podcasting is the exact same thing! Bonus Tip 1 – If you’ve created a 3 tips or 3 mistakes blog post, each tip or mistake can be it’s own video = 3 YouTube videos! Click here to get your free instant access!